Ugh, two weeks have gone by since I last even thought about this blog! Only three posts in and I’m already slacking, tsk tsk. But what a two weeks I’ve had! There was a horrendous summer-flu-thing that kept me off dairy for at least four days (the horror!). And then there were a lot of house guests from Oregon and Maryland and the house down the street, and they all brought doughnuts with them! And then we ate burgers and watermelon while what seemed like the entire population of Bushwick set fireworks off, surrounding us in a hailstorm of sparks and wonder. And then, my friends, there was today. A day when I woke up exhausted and craving nothing more than ice water and salad to counteract all the indulgence that the past fortnight has brought. Whew! But, to be honest, the following recipe has NOTHING to do with any of that. It’s not particularly summery, or refreshing. But it will feed a house full of hungry male roommates. Interesting side note: the bourbon used in this dish was found by one of my co-workers amongst a pile of hundreds of liquor bottles being thrown away, unopened, by a family in Williamsburg. Dumpstering is the best. Since my brain is so fried, I’m afraid that’s all the wit and intrigue you’re getting today. Now, go eat french toast! Zest the oranges and set aside. Generously butter a loaf pan and layer the bread slices within. 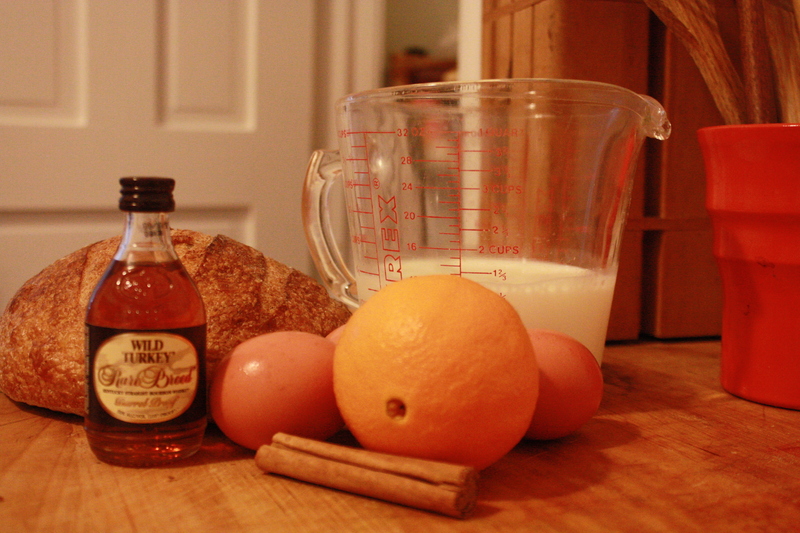 Whisk together eggs, milk, bourbon, orange zest, salt, and spices. Cover and refrigerate for at least thirty minutes, or up to 12 hours. Meanwhile, peel and slice the oranges very thinly. When ready to bake, top the bread with overlapping orange slices and bake, at 425° for 30 minutes. 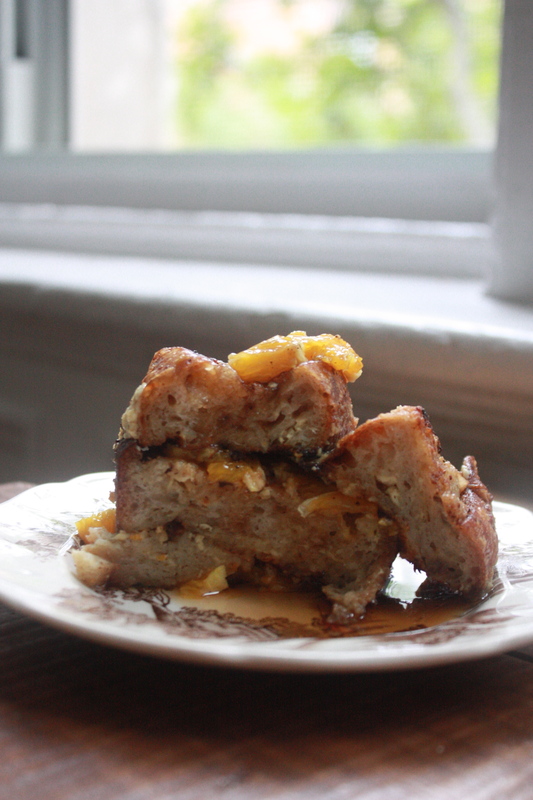 Serve immediately topped with warm maple syrup and butter.